Make your yard more inviting by having seats available for you and your guests. 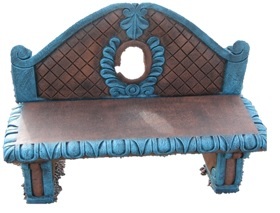 Casa Bonita offers the largest selection of benches in the New Mexico and El Paso areas. Because we manufacture the majority of our benches we offer awesome prices to the public with prices starting at $35.99 for a small bench. Pictured below are some of the benches manufactured by Casa Bonita. Wel aso offer an extensive selection of outdoor tables with benches.